I used to be a schizophrenic but now I’m in two minds would seem to describe the behaviour of the dollar yen at present with yesterday’s long legged doji characterizing yet another day of indecision, and a failure to follow through on the bearish sentiment indicated by Monday’s strong move lower. The fundamental on the economic calendar for Japan has revealed that Japan’s export market fell even further and faster in May with sales abroad falling by 41% year on year and worse than April 39% year on year, thereby highlighting the shallowness of the so called “green shoots”. With the 9 day moving average now having firmly crossed the 40 day giving us a bearish signal, and with the 14 day now also beginning to point lower it is only a matter of time before the weight of any downward pressure begins to tell. Indeed the FOMC statement due out later today may well prove to be the trigger for the yen to dollar pair. 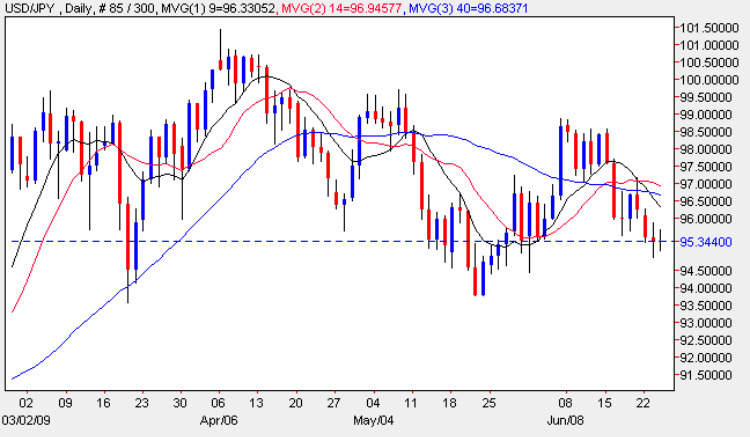 The relationship between the US and the Japanese Yen is to some extent contradictory, as both are considered to have safe haven status, and therefore any severe dollar weakness against other currencies does not necessarily translate into dollar weakness in this pair to the same extent. All other items of fundamental news on the economic calendar for the Dollar is covered in the main Eurodollar site.